Mgr Basil Loftus excels himself in last weekend's column: The Catholic Times, 24th November 2013. 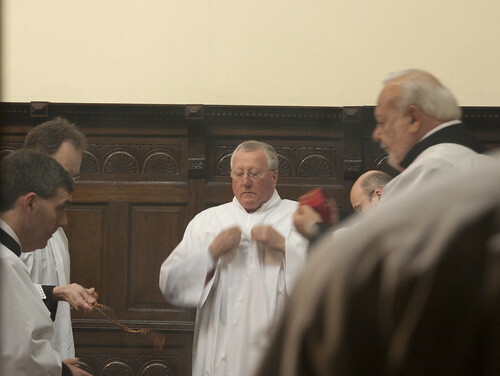 'These excesses [French monarchism, the Order of St Lazarus] are fortunately peripheral in Britain, but we do see churches dedicated exclusively to the celebration of the Tridentine-rite liturgy which sometimes ignore strict prohibitions on the use of thrones and canopies, on the vesting of bishops in the sanctuary rather than in the sacristy, on the washing of a bishop's hands with Jeeves-like servants and on the continuing cult of non-existent saints such as Philomena, who has been banned from every calendar in the world, only to become a cult figure for the opponents of liturgical reform. 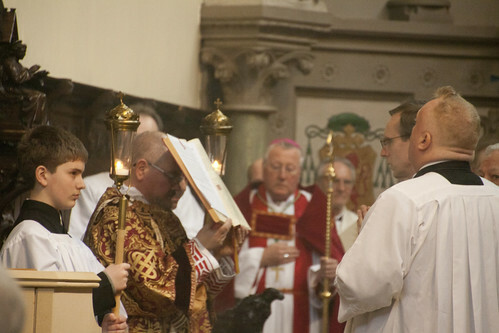 The totems of opposition to post-conciliar Kingdom liturgy are erected in several places where Tridentine-rite liturgy is permitted, even here in Britain. But what's this about multiple churches where only the Traditional Mass is celebrated? I know of none: not one. 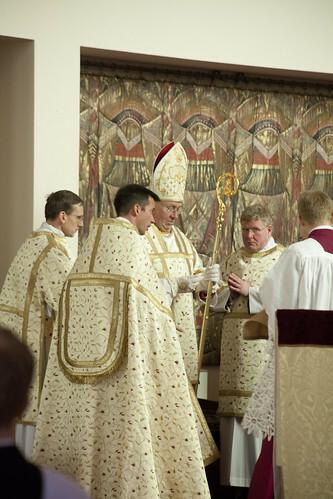 (Loftus talks about it being 'permitted', so we are not talking about SSPX places of worship.) In SS Peter and Paul and St Philomena, where the Institute of Christ the King say Mass in the Wirral, the Ordinary Form is also celebrated once a week (on Fridays: look at their weekly newsletter). No other church in Britain comes close to this level of dedication to the EF: wherever else the EF is celebrated, it is in a church belonging to an standard Ordinary Form parish, with the exception of a handful of private chapels, inside the homes of priests belonging to the Traditional Priestly societies, or in the Orkneys belonging to the Sons of the Holy Holy Redeemer. 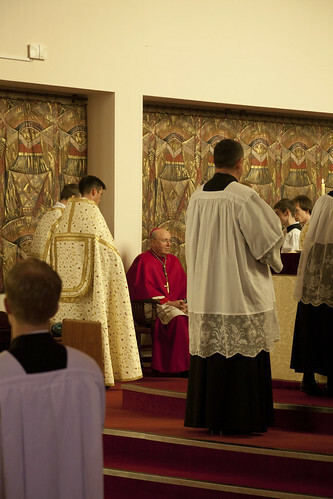 Many of the current difficulties with integrating the celebration of Tridentine-rite Masses into the overall liturgical jurisdiction of a diocesan bishop stem not from Summorum Pontificum itself but from the Ecclesia Dei Commission's application of it. 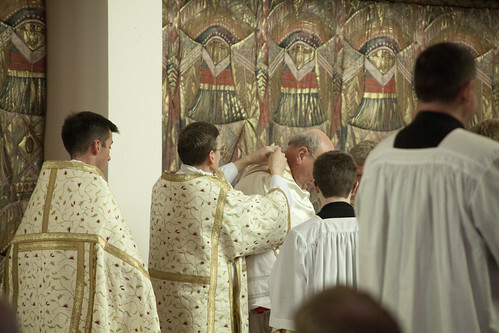 For instance it has ruled that any priest may roam around the countryside seeking fellow-enthusiasts and with no other Eucharistic-community qualification, then demand to be allowed to celebrate a Trindentine-rite Mass in any church they choose. This is plainly nonsensical. Here Loftus is presumably referring to the famous 'stable group' rule, which allows groups of those attached to the Traditional Mass to come together from different parishes, rather than ask for several Masses in several places. It seems quite sensible to me: and it is in the original legislation, Summorum Pontificum (Article 5); it's not something added later by the PCED. Listening to the Gospel, fully vested. Clearly, if you took the 1962 books and applied to them all the changes which happened afterwards you'd end up with the Ordinary Form. What would be the point of that? Art. 12. The same Commission [sc. Ecclesia Dei], in addition to the faculties which it presently enjoys, will exercise the authority of the Holy See in ensuring the observance and application of these norms. Tough luck, mate. Oh, and here's more tough luck. If you think that Pope Francis is going to conduct some kind of fanatical campaign against canopies, you're in for a disappointment. Even leaving aside the EF and focusing only on the OF, Msgr. Loftus is incorrect in his statement that there are "strict prohibitions on the use of thrones and canopies." 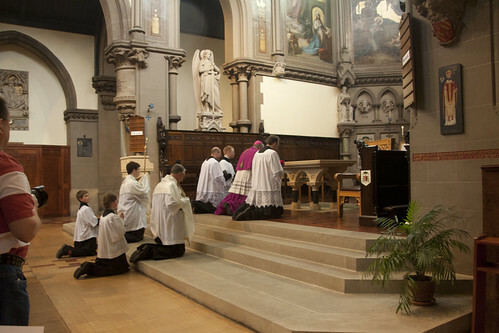 The revised Ceremonial of Bishops (#47) provides for what is a throne in all but name: a chair that stands alone, is used only by the diocesan bishop (or another bishop he permits to use it) and is elevated on steps if necessary so that the people can see the bishop. The Ceremonial says that "There is to be no baldachin over the bishops chair; but valuable works of art from the past are to be preserved with utmost care. Ergo, as we say in the US: "If you like your throne with a baldachin you can keep your throne with a baldachin." This is rather less than an absolute prohibition. The Bishop McMahon in those photos is bishop of Nottingham, not Northhampton.